Over the last couple years, the Church of God Disaster Relief fund has provided matching funds to the German national church to support strategic refugee initiatives launched by local German congregations in response to the refugee crisis there. 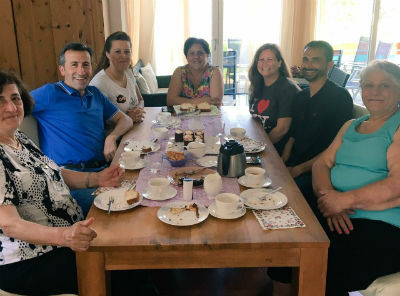 At the invitation and hospitality of the German Church of God, Ken and Keli Oldham (Global Strategy) were able to follow up with a few of these ministries this summer. They witnessed the German church developing significant relationships with refugees as they have sought not just to serve their needs, but to include them into their fellowships. A year ago, Ken had witnessed that the German congregations that are making the most significant gains in serving and developing relationships with refugees are congregations in which there are Middle Eastern leaders who immigrated more than a decade ago, and have been members of these congregations. This testimony continues to be true and consistent throughout the Europe and Middle East region, revealing that God was sovereignly orchestrating key people and experiences to provide leadership long before we were aware there was a crisis. God is good! In one of our northern Germany congregations is a Syrian couple, John and Rhonda (not their real names), who immigrated to Germany more than fifteen years ago. As a restaurant owner and entrepreneur, they found success in their community, and as they began to raise a family, they learned about the German medical and school systems. They actively attended and served in their congregation when dozens of Syrian refugees began to be resettled into their community. They were uniquely gifted and experienced to help their congregation love and include their new neighbors. John sold his restaurants and began driving a city bus so that he could have more consistent hours to help his church serve the refugees; Rhonda has been called on by hospitals and doctors in the community to help refugee women, especially in cases of pregnancy, to understand the very different health programs and services offered in Germany. 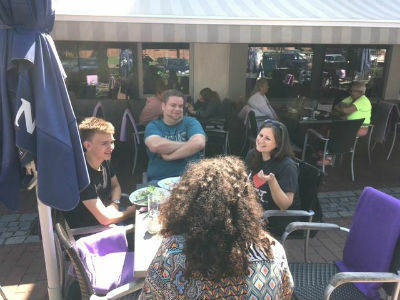 Keli shares with Anna, her youth pastor, and another German teen at a cafe this summer. John continually reaches out to Syrian families and invites them to receive support and love from their local church. Here’s a great developing testimony of one Syrian teen, Anna (not her real name). Though born a Muslim, Anna does not practice that faith, though she believes many of its teachings. She admitted to being hesitant to accept John’s invitation to the church youth meetings, but she was curious to meet German teens. As she went, she found connection among the youth and was invited to attend more opportunities at the church. Anna shared with Ken and Keli that she has found an extended family through the support offered by the church, and calling the church’s sincere love inspiring. Now, every week, Anna not only attends the youth group meeting and the Sunday worship service, but she has also sought to volunteer in both those meetings. The church has made room for her to do so by allowing Anna to regularly read Scripture and even sing on praise teams. Anna said that she desires to learn more about the teachings of Jesus that have informed the church that welcomed and embraced her family. In another German community, a young Iranian man, Adam (not his real name), immigrated more than ten years ago after living in Greece for about six years. He had dramatically converted from Islam to faith in Christ and fled his home and family to live freely in that new faith. 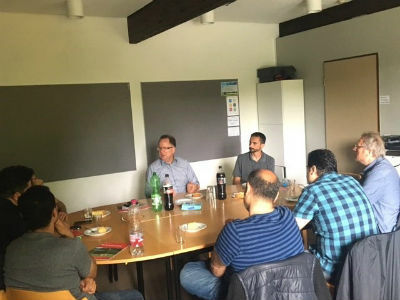 He found connection and support in one of our German congregations. Then, a couple years ago, hundreds of Iranian and Afghani families began to be resettled in that city, and once again, the Church of God had someone uniquely experienced and burdened to help them reach out to their new neighbors. This summer, Ken and Keli met five Iranian men in that congregation who each had a testimony of being invited to the church by Adam. Each of the men shared how their families have found community in the church, not just because of Adam, but because of the same level of love and inclusion offered by the German families there. While each expressed thankfulness for the German government for providing sanctuary to their families in their time of need, each were even more grateful for the church. Each of the men spoke of how it would have been easier to stay separate and attempt to maintain their own language and identity in sub-communities; but through the love and welcome of the church to their families, they have made friends who support them and are patient with them in learning the German language and culture. The men credited the church with helping their families understand German society and giving them the opportunity to really assimilate into their new home. Small jobs are available to these men now, but mastery of the German language with the church’s help, will enable them to use their previous skills, education, and training in better career opportunities in the future. With the help of German leaders, Ken listens to the testimonies of five Iranian men. These are just a couple examples of how God is working powerfully within and through the German Church of God. It has been a blessing to watch these congregations demonstrate the love and unity found in our Savior. Continue to pray for the Church of God globally to extend grace and welcome to their neighbors regardless from where they originated. For questions regarding this and other disaster relief efforts in the United States and abroad through the Disaster Relief fund (Project 45.04502), contact Stephen Lewis at the Global Strategy office by e-mailing SLewis@chog.org, or by calling 800-848-2464, ext. 2198. Ken and Keli Oldham are Global Strategy representatives to the Middle East and serve as point persons to refugee ministries in the Europe and Middle East region. This entry was posted in All Church of God, Disaster Relief, Global Strategy and tagged 3W, aid, assistance, Disaster Relief, Europe and the Middle East, Europe-Middle East, German, Germany, global, Greece, hospitality, immigration, Iran, Islam, Ken and Keli Oldham, Ken Oldham, Middle-Eastern, migrants, missions, Muslim, refugee crisis, refugees, Syrian refugee crisis, Three Worlds. Bookmark the permalink.